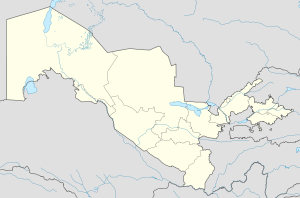 Angren (Uzbek: Angren / Ангрен; Roushie: Ангрен) is a ceety in eastren Uzbekistan 70 mi (110 km) east o Tashkent. It wis foondit in 1946 as a center for the Uzbek SSR's coal industry. It is locatit on the Angren River. A notable industrial town, it has a large construction-materials industry, a rubber processing plant and a power station. Prior tae the collapse o the Soviet Union, the city had a significant Russian population. The population o the ceety haes declined syne the early 1990s acause o vera poor livin conditions, unemployment an mass immigration. In 1992 it haed a population o 133,000 but as o 2005 it wis 126,962. Ilyos Zeytulayev - A regular for the Uzbekistan naitional fitbaa team. This page wis last eeditit on 10 Mairch 2018, at 20:17.